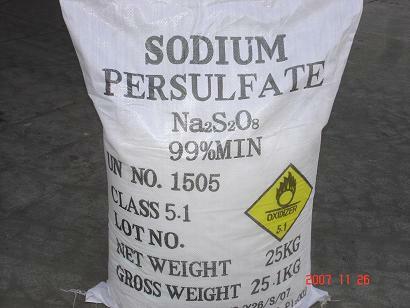 Sodium persulfate is not combustible, but assists combustion of combustible materials due to release of oxygen. It must be stored in a dry location away from heat and a cool, well ventilated area away from all sources of ignition and out of direct sunlight, protected from moisture. Keep containers tightly closed, labeled and well sealed. Ensure pressure relief and adequate ventilation. It must be stored separately from organics, rust or traces of metal, reductions and others incompatible materials to avoid catalytic decomposition. Copyright © 2010 sodium persulfate. Аммония персульфат.